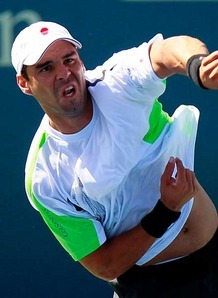 Youzhny, Monfils and Blake early loses in Cinci. Gael Monfils suffered an early exit in the ATP Western & Southern Financial Group Masters at the hands of qualifer Alejandro Falla. The Colombian converted three of his four break-point chances on his way to recording an impressive 6-3 6-4 triumph in just over an hour. Next up for Falla in Cincinnati will be Germany’s Philipp Kohschreiber, who battled back to beat Horacio Zeballos 6-7 (2-7) 6-3 6-4. However James Blake fell at the first hurdle, the former champion suffering a 6-3 6-0 loss at the hands of Russian Denis Istomin in just 45 minutes. “I didn’t have my best, or even close to my best. I haven’t felt prepared for a tournament for a long time thanks to a lot of injuries,” the American said. There was better news for Blake’s compatriot Mardy Fish, as he knocked out Frenchman Gilles Simon 7-6 (7-4) 7-5. Andy Murray now knows he will face Jeremy Chardy in his opening match after the Frenchman eliminated German Florian Mayer 6-2 7-6 (7-4). Julien Benneteau won an all-French tussle with Michael Llodra 3-6 6-3 6-2, while Richard Gasquet rallied from a poor opening set to triumph 2-6 6-4 6-1 against Russian Mikhail Youzhny. In early second round action, seventh seed Tomas Berdych saw off the challenge of Paul-Henri Mathieu of France 6-4 6-4, while Marcos Baghdatis won a final-set tie-breaker to knock out Thomaz Bellucci 6-2 4-6 7-6 (7-4). Federer lucky to survive a major upset in 1st round. Defending champion Roger Federer came back from the brink as he narrowly avoided becoming the casualty of the greatest upset in Wimbledon history. Federer was two sets down to unheralded Alejandro Falla and the Colombian then served for the match in the fourth set before losing 5-7 4-6 6-4 7-6 (7/1) 6-0. Only two defending champions had ever lost in the first round at the All England Club and Federer had to use all his fighting spirit to avoid becoming the third. The six-time champion, looking to equal Pete Sampras’ record of seven this year, was not at his brilliant best but was far from shabby. Falla, on the other hand, played the match of his life, Federer describing his performance later as “incredible”. The left-hander more than lived with Federer from the back of the court, looked a threat when he came to the net, while his swinging serve out wide to the backhand was a constant problem – a worrying sign for Federer if he now goes on to meet Rafael Nadal in the final. Certainly he seemed to be a different player from the one who had lost 6-1 6-2 to Federer in Halle less than a fortnight ago. The first set had seemed destined for a tie-break before Falla gained a surprise break in the 11th game courtesy of a deep volley. The man ranked 60th in the world had served for the first set against the Swiss at the recent French Open only to choke but that was not the case this time. The crowd on Centre Court expected Federer to raise his level in the second set but we wasn’t actually playing that badly. Falla was having few problems dealing with Federer’s renowned serve though and the fans really began to sense an upset when the Colombian broke in the sixth game. He shows signs of nerves when serving for a two-set lead at 5-4. Three set points were missed – and two break points saved – before the set was finally clinched, Falla putting away a volley with his opponent having been dragged out of court. Surprisingly, Falla then called for the trainer for treatment on a groin injury, but it didn’t stop him contining his sparkling form. Despite the trainer returning at each change of ends, the set progressed on serve to 4-4 at which point Federer stood at the precipice. He fell 0-40 down only to save all three break points – plus a fourth – before holding, converting game point following a thrilling net exchange at deuce. Federer made Falla pay for mising his chance by breaking him for the first time in the match in the very next game to reduce the deficit to two sets to one. Many expected the Swiss to roll on through the rest of the match but such thoughts were soon put to one side as Falla broke in the opening game of the fourth set. Things progressed on serve to 5-4 at which point Falla stepped up to serve for arguably the biggest upset in the tournament’s 133-year history. But he was to fail. 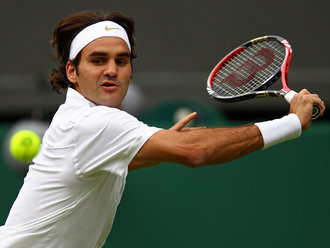 Federer forced two break points, taking the second with a trademark crunching forehand. The top seed dominated the ensuing tie-break to forced a decider, one which turned out to be something of a non-event. Federer immediately broke serve as Falla’s level dropped considerably. The Swiss star pushed on to win it to love, finally booking his place in the second round after almost three and a half hours on Centre Court.